Macey Way said Monday was her “best day ever” after winning gold Monday in the Women’s Air Rifle at the National Junior Olympic Shooting Championships (NJSOC) at the Olympic Shooting Center in Colorado Springs, Colorado. The Fort Smith JROTC Grizzly Air Rifle Team worked hard all season and it paid off. The team of Fort Smith, Arkansas high school students who are supported by Umarex USA, placed 1st in four Arkansas Invitational Matches and individual team members have risen above the rest as overall high score shooters. Attendees at the 148th NRA Annual Meetings in Indianapolis, Indiana, will have the opportunity to see the Official Camouflage Pattern of the NRA, Mossy Oak OVERWATCH. The NRA Annual Meetings will be open to the public Friday, April 26 through April 28. NIKKO STIRLING Optics will be exhibiting at Legacy Sports International’s booth #312 at the NRA convention in Indianapolis, In from April 26- 28. Viridian Weapon Technologies is showing the FACT Duty Weapon-Mounted Camera at the annual conference of the Texas Police Chiefs Association. The event is in Galveston, April 16 and 17. Breakthrough Clean Technologies will be exhibiting at the NRA Annual Meetings and Exhibits in Indianapolis. Stop by the Breakthrough Clean booth to take advantage of their show specials. Smith & Wesson Corp. announced that the company’s M&P15-22 SPORT rifle is now available with a factory-mounted MP-100 Red/Green Dot Optic. Chambered in .22LR, the M&P15-22 SPORT rifle is an optics ready configuration that includes a red/green dot MP-100 optic. Savage is proud to introduce the 110 Apex Hunter XP, which pairs a Model 110 rifle with a 3-9x40mm Vortex Crossfire II scope that comes mounted, bore-sighted and ready to hunt. Beretta announced the launch of a brand-new pistol, the Beretta APX Carry. It extends the APX platform to include a single stack, sub-compact profile offering. DeSantis Gunhide introduces 20 holster fits for the SIG P320 XCOMPACT pistol. These holsters, and others, will be displayed at the NRA Annual Meeting. Berger Bullets announces its new .375 caliber ELR Match Solid Bullet has been selected for the Extreme Sniper Strike Operations program. The ESSO program is a US government project. American Defense Manufacturing announced that the Las Vegas Metro Police Department (LVMPD) has approved the UIC line of rifles as an authorized duty weapon for individual officer purchase and use for official law enforcement capacity. The full-time R&D Firearms Design Engineer is a full-time position working with a team of professionals to develop, design, test and produce new models in addition to continuous improvement of existing product lines. Pachmayr introduces the Custom Series Pearly Pistol Grips, the ultimate custom look for the 1911. They replicate the appearance and feel of actual mother of pearl but at a much lower cost. Apex Tactical Specialties announces two new Action Enhancement Kits specifically designed for the CZ Shadow 2 and the CZ 75 B. The new kits are available for pre-order now and will officially ship on April 23. Outdoor Edge has introduced the ParaSPARK bracelet and the Ignitro knife, a pair of new survival tools complete with built-in fire-starting materials as well as razor sharp blades. RISE Armament announced release of the updated RA-901 Stinger Handguard. It incorporates anti-rotation tabs to ensure proper positioning and is a 15-inch free-floating M-LOK handguard. Following the close of registration for Academic Archer, NASP conducted a random computerized drawing from among all registered students and selected ten student names. Each of these young people won a new Genesis Bow. The Firearms Industry Compliance Conference, hosted by NSSF and Orchid Advisors, is offering 3 months Free Gearfire eCommerce and Live Inventory Technology to the first 150 Retail and Range FICC Registrants. For the next year, a select group of six passionate young Americans will serve as Ambassadors for the shooting sports, supporters of the Second Amendment, and representatives for the NRA’s commitment to building the next generation of shooting athletes. Cordova Outdoors, the officially licensed cooler of the National Rifle Association, is excited to announce a special 10% discount on all hard-side coolers purchased at the 2019 NRA Show. Barrett Firearms Manufacturing, Inc. is giving away a Crossfire Red Dot Optic with any REC7 or REC7 DI system purchased April 15 through August 15, 2019. Valued at over $200, the optic is covered by the lifetime, unconditional, no-fault, transferable, Vortex VIP Warranty. This week, Shooting USA covers The Grind – a Pro-Am Precision Rifle Match that’s growing the sport. It has become the largest ever on the circuit, graduating last year’s amateurs to teaching pro status, while bringing in new shooters to get them enjoying the shooting sport. 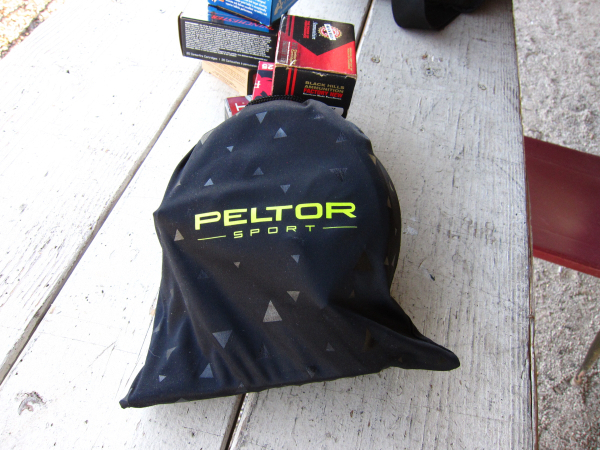 I became aware of the Peltor Sport Tactical 500 Electronic Hearing Protector at the pre-SHOT Industry Day at the range. I was asked to try them out, comparing them to another set I’d had on that day. If you’ve not been, Industry Day can get very loud. With the prominent wind gusts, it was cold out and the ambient noise level without industry revelers was high too. These things are like other amplified ear pro in the sense that hearing-safe sounds – the human voice – are amplified, handy for old-timers like me. Unsafe sound levels are suppressed. The manufacturer alleges some aspects of the “SMART technologies,” like “clear voice tracking.” All I can say is that I was able to hear –and understand – folks speaking around me. The suppression time varies through some alchemy according to the “energy of the report and echoes in the location.” A sudden loud noise with no echoing reverberation is clipped while the thundering racket on an indoor range, say, would be muffled for a longer period. The top band of the muff has vents to allow that troublesome button atop some billed caps to protrude . . . instead of being pressed into the shooter’s melon. The TAC 500 features blue-tooth technology. It’s untried by me so far as I don’t answer calls at the range – full time and attention being given to machinery being operated – and I don’t listen to music from a ‘smart’ phone while working at the range. 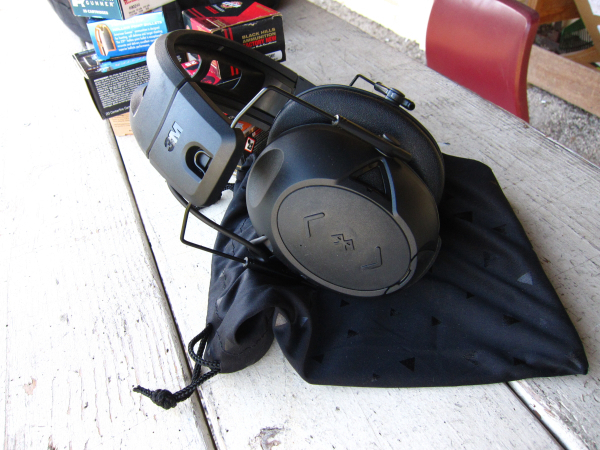 The muffs feature a 26 dB Noise Reduction Rating, auto shut-off feature, a “voice guidance feature” (“Power on” – kinda spooky), recessed microphones to reduce noise from wind/fans, and low profile cups for use with shouldered firearms. I’d been back from SHOT for a couple of months when I was notified of a package at the local depot. I found the TAC 500 unit awaiting me. I used them on the next range trip during which I fired under a covered firing line as well as having used them for a half-day excursion to the retirees’ range. At that event, there was always a line of shooters. The TAC 500 gave transparent functioning; I could clearly hear and understand everyone who spoke – though some couldn’t hear me as I spoke in a normal tone – and my ears didn’t ring from repeated exposure to gunfire. And that’s what this unit is designed for. From the “I have famous friends” department, I was notified yesterday of a new video about a man I’m happy to know. 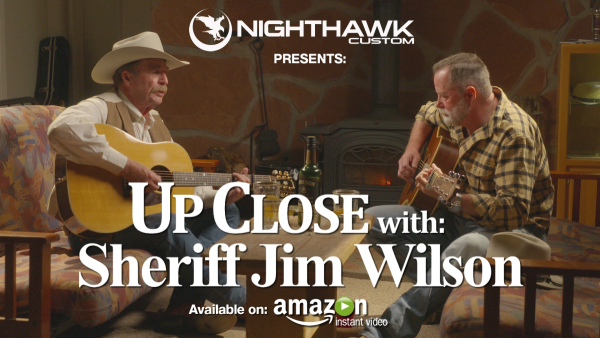 The video is Up Close: with Sheriff Jim Wilson and it’s an interview of the Sheriff by the Outdoor Wire’s own Richard Mann. It’s available on Amazon Prime Instant Video.